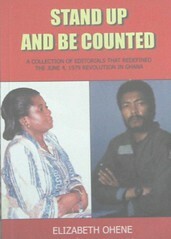 These books represent a very important point in recent Ghanaian history and therefore make for very interesting reading. Elizabeth Ohene, a current Minister of State and former BBC presenter, was a columnist and editor for the The Daily Graphic, one of Ghana’s longest running government owned newspapers during a really interesting period in Ghana’s history. In 1979 Ghana was under the control of a military government led by General Akuffo. He was overthrown by another group of soldiers led(sort of ) by then Flight Leftenant Rawlings. He held elections and passed Ghana on to a democratic government, then returned a year later to overthrow that same government and establish himself as head of state again in 1981. This was the period for which she was editor and its the time period both of these books cover. “Stand up and Be Counted” is made up of her editorials over this period and “Thinking Allowed” is a column she wrote before and after she was editor. In both books she made a habit out of challenging the motives and actions of the ruling governments of the time, which was really unusual for a high ranking member of the state owned media. And probably a large part of the reason she had to flee the country after Rawlings came back. The books are therefore interesting on two levels. on one because they provide insight into a very interesting period in Ghanaian history (I was born in ’79 when all this was going on) and they are also a record of a great deal of personal courage. Opposing the ruling government at that point in Ghana’s history was not exactly the healthiest move on the planet. Especially since she was doing it from the paper they owned. It was an act of extraordinary bravery which is especially impressive when held up to the extreme levels of mediocrity that a decent section of the Ghanaian media is aggressively pursuing. 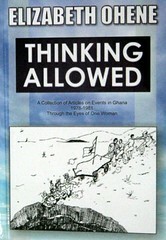 Does anyone know how i can purchase copies of Ms. Ohene’s books? I cannot seem to find them online. Thank you in advance for your help.